﻿ Real Madrid 3-0 Atletico. Ronaldo, Ronaldo, Ronaldo! 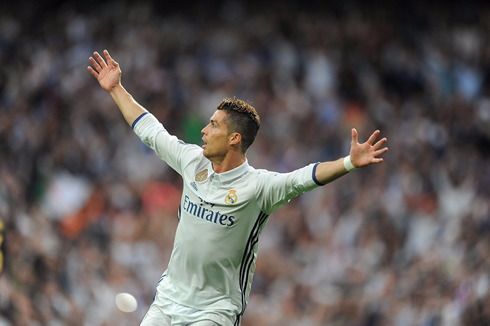 02.05.2017 » Real Madrid 3-0 Atletico. Ronaldo, Ronaldo, Ronaldo! Giant step towards the Champions League final! 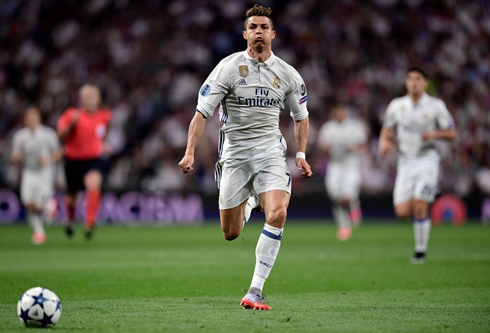 Real Madrid crushed Atletico this Tuesday night in a 3-0 home win and it was Ronaldo who demolished all the Colchoneros' hopes with another epic hat-trick! What a night! Now to the match. Real Madrid controlled proceedings well, putting together a really mature performance and essentially taking the game away from their rivals. They passed well, they got to the loose balls, and they threatened when needed. With Isco in for James, Madrid played a 4-4-2, the same formation we played when we beat Atletico in the Calderón earlier this season. Ronaldo scored within 10 minutes, heading home from a Casemiro cross. 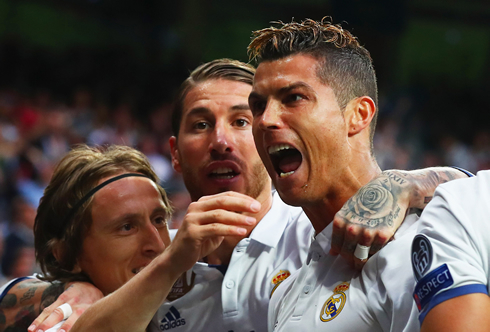 A tidy finish from close range and a comforting goal for Real Madrid. The Merengues looked dangerous, but Atletico settled well and Gameiro was eventually put through on goal, only being denied by Navas, who was forced into action soon after. The second half would actually see Atletico Madrid get more of a footing in the game. As they began to have a bigger share of the possession, Real Madrid seemed to relax a bit too much and the energy levels weren't the same. Carvajal had already gone off and though Nacho did really well down the right, he wasn't the same attacking threat. As time went on, the match began to resemble the recent 1-1 draw in the league, when Antoine Griezmann's late goal stunned the crowd. But today, that wasn't going to happen if Ronaldo had anything to say about it. The second goal was a fantastic volley from the edge of the box, after the ball bobbled up into the air. With precision and timing, Ronaldo stared the ball down and delivered a smashing volley into the roof of the net. 2-0! Then it was time for the third. Ronaldo and Vásquez had a nice exchange on the wing before Lucas sped into the box. Ronaldo's known for his positioning of course and he was again excellent here getting in the right place at the right time and finishing off the square ball. A hattrick - rivals defeated and decimated. Cristiano Ronaldo is the greatest player in Champions League history. After scoring two goals in the group stages, he's now recovered scoring 8 goals in his last three games. Some decline huh? Real Madrid have one foot in the final! Cristiano Ronaldo next game is a La Liga fixture, on May 6 of 2017 against Granada. You can watch Juventus live stream, Granada vs Real Madrid, Sevilla vs Real Sociedad, Celta de Vigo vs Manchester United, AS Monaco vs Juventus, and Ajax vs Lyon, all matches provided from our live football game pages.